For the head of state pre-1504, see King of Mann. The title Lord or Lady of Mann (Manx: Çhiarn Vannin) is used on the Isle of Man to refer to the island's Lord Proprietor and head of state. 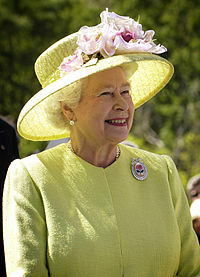 The current holder of the title is Elizabeth II. The title is not correctly used on its own. Since 1399, the kings and lords of Mann were vassals of the kings of England, and subsequently of Great Britain and the United Kingdom, who was the ultimate sovereign of the island. This right of 'Lord Proprietor' was revested into the Crown by the Isle of Man Purchase Act 1765 and hence ceased to exist separately. King George III became the first British monarch to reign over the Isle of Man as Lord of Mann in 1765. However, for reasons of culture and tradition, the title Lord of Mann continues to be used. For these reasons, the correct formal usage, as used on the Isle of Man for the Loyal Toast, is The Queen, Lord of Mann. The title is now Lord of Mann regardless of gender. However, during her reign, Queen Victoria was styled as Lady of Mann. The formal Latin style is Dominus Manniae. Prior to 1504, the ruler of the Isle of Man was generally styled King of Mann. In 1598, a succession dispute between the daughters of Ferdinando and their uncle, William, Earl of Derby was heard by the Privy Council. They decided that the right to the Isle of Man belonged solely to Queen Elizabeth I, and the letters patent of 1405 which conferred the lordship of the Isle of Man on the Stanley family were declared null and void as the previous ruler, Henry, Earl of Northumberland, had not been subject to legal attainder, despite his treason, and the 1405 and 1406 letters patent had therefore not taken effect. The Queen, in consideration of the "many eminent services performed to herself and to her royal predecessors by the honourable and noble House of Stanley", withdrew her right and referred the contending claimants to the decision of the Privy Council as to the best claim of inheritance. The Law Lords on the Privy Council decided "the grant being by letters patent under the Great Seal of England, such right would descend according to the Common Law of England to the heirs general, and not to the heirs male", and the island was therefore awarded to Ferdinando's daughters; whereupon William agreed to purchase their several shares and interests. The original letters patent having been declared void, the Parliament of England in 1609 under James I passed a Private Act of Parliament entitled "An Act for assuring and establishing the Isle of Man in the name and blood of William, Earl of Derby" [(1609) 7 Jac.1 c.4] which established the title in law as Lord of Mann. The lordship was conferred by letters patent dated 7 July 1609 upon William Stanley, 6th Earl of Derby. Subsequent succession was under the terms of this grant. Following the resolution of the succession dispute, it was ruled that the daughters of Ferdinando Stanley were the rightful heirs. As the oldest of them would not reach the age of majority until 1609, two temporary Lords of Mann were appointed by James I by letters patent, so that the daughters could benefit from the Island's revenues. Following the coming of age of the heirs, the rights over the island were sold to their uncle, William Stanley. He took up the title of Lord of Mann following the passing of an Act of Parliament. In 1765, Charlotte Murray, Duchess of Atholl, 8th Baroness Strange, sold the suzerainty of the island to the British government for £70,000 and an annuity of £2,000 (£5,235,000 and £150,000 respectively in modern terms). By the passage of the Isle of Man Purchase Act 1765 the title of Lord of Mann was revested into the British Crown. It has therefore since been used on the Isle of Man to refer to the reigning Monarch of the United Kingdom. The Lord of Mann is now represented by the Lieutenant Governor of the Isle of Man. ^ "A new electorate for the Isle of Man". BBC News. 19 November 2006. Retrieved 11 May 2010. ^ "The official website of The British Monarchy". Royal.gov.uk. Archived from the original on October 29, 2013. Retrieved 2013-10-27. ^ "Contents - From King Orry to Queen Victoria, 1899". Isle-of-man.com. Retrieved 2013-10-27. ^ "Note 20 - ManxSoc Vol 12 Parr's Abstracts". Isle-of-man.com. Retrieved 2013-10-27. ^ "William, Sixth Earl of Derby". Isle-of-man.com. Retrieved 2013-10-27. ^ "pp88 - Manx Soc vol 9 'Monumenta de Insula Manniae - Vol 3'". Isle-of-man.com. Retrieved 2013-10-27. ^ "Currency converter". The National Archives. Retrieved 2012-07-06. ^ "History Pages Isle of Man -Act of Revestment". Isle-of-man.com. Retrieved 2013-10-27.